The website Island Folklore – dedicated to the promotion of Taiwanese cultural heritage, has mapped out the 22 living languages which are spoken in the country today. The island nation had a multitude of influences, but the main language groups found spoken today are the Austronesian and the Sinitic one. Taiwan prides itself on its well established framework for indigenous minority rights, which is also reflected in this linguistic reality. Although improvements can still be made, as highlighted in UNPO’s European Parliament conference in June 2016, it functions as an example for other South-East Asian countries. The Austronesian languages are an extraordinarily diverse and widespread family of languages. Not all the languages in the above chart are native to Taiwan. The island’s Austronesian languages are known as “Formosan languages.” These are some of the oldest and most varied branches of the greater Austronesian language family. Linguists currently have no universally accepted method for distinguishing between “language” and “dialect.” In academic circles, “variety” (or “lect”) usually replaces the two poorly defined terms. The languages of Taiwan fall under two main groups: Formosan and Sinitic. Within each group, varieties are sometimes regarded as dialects (like the many regional varieties of the English language). However, since the majority of Taiwan’s languages are not mutually intelligible, those within the same family tree may be more accurately described as related but distinct languages (similar to how French, Occitan, Spanish, Portuguese, Catalan, Italian, Sardinian, Sicilian and Romanian are all distinct languages that evolved out of Latin). Ultimately, language is a constantly evolving communications tool. Over time and distance, originally closely related accents, dialects and varieties can become increasingly dissimilar. Exactly at which point a dialect becomes a language (or vice versa) is impossible to tell, which means that an inflexible division between “language” and “dialect” does not accurately reflect reality. What is certain is that Taiwan indeed has a remarkably high degree of linguistic diversity that reflects the island’s heterogenous cultural and ethnic roots. 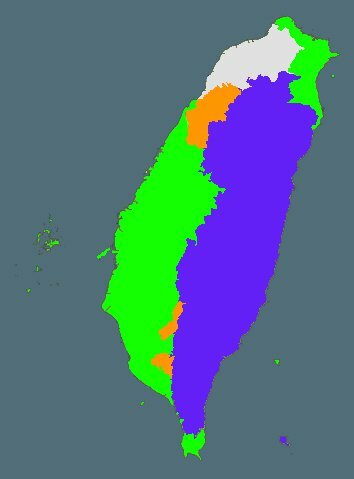 Note: The image above shows the approximate distribution of Taiwan’s main linguistic communities: Formosan languages (purple), Taiwanese (green), Hakka (orange), Mandarin (grey).